Anytime we can't think of something to do, we pull out our LEGO bricks and start building. Sometimes we try LEGO challenges or play Feed the LEGO monsters too. Last summer we built a temporary LEGO wall in our family room and the kids thought it was so cool to create together. This summer we are kicking off our 4th annual LEGO Week. Each summer we like to gather together some of our favorite blogging friends and create activities using our LEGO bricks. The activities that we create are usually for the toddler or preschool crowd, but then some of our other friends come up with ideas for elementary school ages kids too. LEGO Week might be my favorite week of the summer! You can check out previous LEGO Week activities HERE: 2014, 2015, and 2016. We will also be sharing some fun activities we try on Instagram stories, so go over and follow us on Instagram! I'm at @kristinatoddlerapproved. 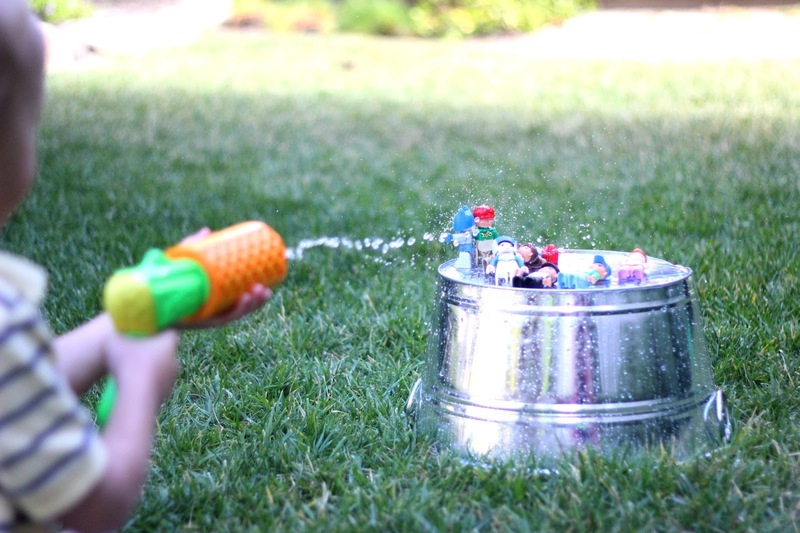 To get started with LEGO Week we are sharing a simple LEGO minifigure knock down game using water guns. We love coming up with cool ways to work on hand eye coordination and also be outside and playing with water! This knock down game involves all of that! Collect all of your minifigures from around the house. Fill up a few water guns and then set up your minifigures on top of a container or small table. Arrange them in whatever order you want. 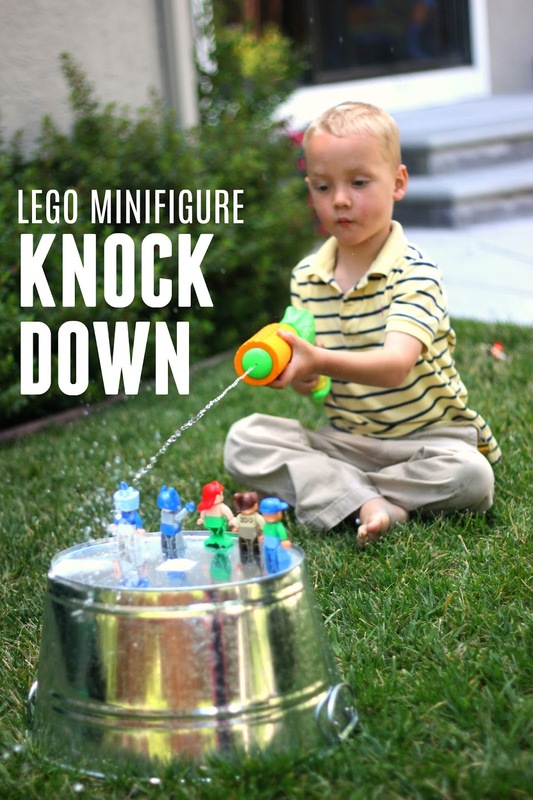 Start spraying down the minifigures and see how many you can knock down with one squirt! Then pick them back up again! We had fun trying out a few different water guns to see which type of water pressure knocked the minifigures down faster or slower. It was a neat little experiment! We also arranged the minifigures in different ways to see if that impacted how quickly they all fell down! We did this activity on repeat for awhile because it never seemed to get old. I really enjoyed jumping in and trying it out too. If it is a hot day, wearing swim suits could lead to a full fledged water fight while playing this, so be prepared! Unfortunately the weather in Northern California has been chilly for the past days so we weren't in a rush to get completely soaked and my kids stayed surprisingly dry! We are going to have to try this again on a hotter day! Have you ever tried target practice with your LEGO bricks or minifigures? If not, you'll want to add this to your "must try" list this week. All of our LEGO Week co-hosts will be sharing additional fun activities today over on our LEGO Week Landing page. Make sure you pop over there and check them out! The activities will be updated daily all week long.